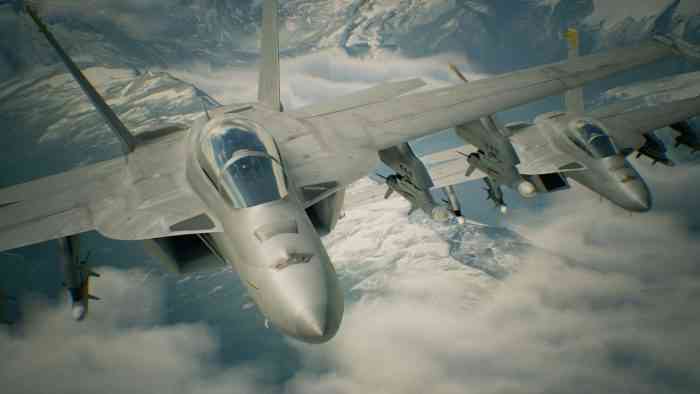 Twelve years after the release of the last numbered entry, Bandai Namco’s aerial combat franchise is finally back with Ace Combat 7: Skies Unknown. As a newcomer to the series and someone who knows absolutely squat about planes, I decided to hop in the virtual cockpit to see for myself what the fuss is all about. Though I did crash into more mountains than I’d like to admit, I ended up having a blast ripping through the skies and taking down enemy bogeys. Over the course of the 20 mission long campaign (made longer by my inability to fly in a straight line), I found plenty to like about Skies Unknown, but also a few things that frustrated me to no end. After exploring a more realistic direction, Skies Unknown returns the series to its arcadey roots. Planes carry an absurd number of ammunition. An always visible score counter tallies up points for every kill you earn. The officer in your ear shouts “Fox two!” when you fire missiles. There’s an emphasis on fun – after all, who doesn’t like raining down massive explosions from above? Likewise, Skies Unknown’s story also doesn’t take itself too seriously. Set in the hilarious-named alternate universe of Strangereal, you follow the journey of a hotshot pilot through his fall from grace and his inevitable rise to become the hero of a war between rival nations. Along the way, you meet a cast of silly characters and even a pretty princess. With so many games nowadays moving towards realism, it’s refreshing to play a triple A release that feels like an homage to a bygone era of gaming. The arcade nature of Skies Unknown ensures it’s easy to pick up the controller and start flying, even if you’re like me and have never played a game of this genre. There’s no need to worry about how to take off and land. You don’t even need to know the difference between roll, pitch, and yaw. To shoot down planes, just wait a lock-on and let the homing missiles do the work. You’re not punished for being a novice pilot, though having some basic knowledge of combat maneuvers will help prevent dogfights from turning into competitions of who can do more donuts in the sky. And the simplicity of the gameplay doesn’t mean Skies Unknown is lacking in depth. Only once I completed the campaign did I learn about two techniques called “high yoyo” and “post-stall maneuver”, both of which would’ve came in handy during the final battles. I can only imagine there’s many more maneuvers I don’t know about. Unlockables come in the way of the Aircraft Tree. For every match played, be it in singleplayer or multiplayer, you earn currency which is used to buy new planes, plane parts, or weapons. Even better, a majority of these upgrades work in both modes. No matter how you spend your time in Skies Unknown, you’re always progressing towards a wider arsenal – which is great, because it’ll likely take some time to unlock all 30-something planes.